Sunday’s Monaco GP was a reasonably exciting race, but not a thriller by any stretch of the imagination. Mark Webber drove a strong race to beat his teammate yet again. Sebastian will not be pleased with this, and I’m sure we will see a resurgent Vettel for the rest of the season! Mark has added his name to the list of greats who have triumphed around the Principality. Victory in Monaco will probably be the highlight of his season, if not his career, and something that the Australian can be proud of. Unfortunately, the race will be remembered for two quite ridiculous events. The first one was Jarno Trulli’s collision with Karun Chandok. I have never watched a crash live onboard before … Jarno’s car literally chopped the T-cam off Chandok’s car! The wrecked cars partially blocked the track at the Rascasse corner, leading to the fourth safety car of the race. The safety car stayed out until the end of lap 78, after which it pulled into the pits, and the green flags/lights were shown … surely the cars were under racing conditions? Think again. Apparently, the green flags didn’t mean “all clear”, but Michael Schumacher interpreted it that way, and overtook Fernando Alonso into the very last corner. Michael would later be demoted to 12th position, as a direct result of the overtaking move. To be honest it was ridiculous! How can the marshalls wave green flags, and the green lights be shown WITHOUT the track being “all clear”? The rules as they stand are confusing and even contradictory. Green flags mean all clear! The F1 rules should be changed to the ones similar to IndyCar i.e. full course yellows. That way there would have been no misunderstanding, and no controversy. As I mentioned last week, Nick Heidfeld has become the official Mercedes Grand Prix reserve driver. “I am very pleased to be joining Mercedes Grand Prix”, Heidfeld said. He also suggested that he would have preferred a race seat, which is completely understandable for a competitive racing driver. Nick could deputized for an injured/unwell race driver, and that could result in a race seat for Heidfeld in 2011. F1 test/reserve ‘drives’ can also mark the end of a driver’s F1 racing career, as Fisichella, Panis, Badoer, Gene, and Wurz have demonstrated. I was going to include de la Rosa, but he has had a lucky reprieve! Ex-BMW driver Nick Heidfeld has joined the Mercedes F1 Team, as the official test driver. Nico Rosberg and Michael Schumacher will undoubtedly get the lion’s share of pre-season testing, and current F1 regulations prohibit F1 testing during the season. Nick will therefore use the team’s simulator, but some might question why Nick joined the team, as he will get very little track time. If you look at it from another angle, it was a smart move. I would be very surprised if Nico Rosberg didn’t deliver the goods this year. This is the first time he has had truly competitive machinery at his disposal, and I’m sure he will make the most of it … not that I’m expecting him to win the title! Michael is tipped to challenge for this year’s Championship, and it would be a very brave man to doubt Michael’s ability and renewed hunger. Nick could be in line for a drive with Mercedes in 2011, or even sooner. Anything can happen in F1, especially during a fiercely competitive season. Michael’s performances could be slower than anyone was expecting, or a heavy shunt could make him think twice about driving at the age of 41. 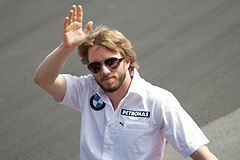 A recurrence of his neck injury could halt his driving mid-season, and therefore Heidfeld could replace him, in which case a 2011 drive is almost guaranteed. Should Rosberg fail to deliver, Heidfeld could be drafted in at short notice …..